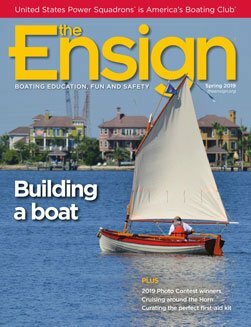 “The captain got a call at 6:30 p.m. saying there was a sailboat in distress, and we’ve turned back to see if we can help,” she replied. Other passengers overheard and peppered her with questions. “What kind of sailboat?” “Where is it from?” “Where is it going?” But the concierge had no answers. While I was looking at the dessert menu, the ship shuddered to a halt. At 1930 we joined the six others at our table for dinner. From the passengers and crew, we learned it would take about two hours to reach the French sailboat, which had been drifting with a broken rudder for four days. We had left Fort Lauderdale, Florida, five days before on Holland America’s Nieuw Amsterdam on a repositioning trans-Atlantic passage to Barcelona. We were two days out of Horta in the Azores, which was our first port of call and the main reason we were on this cruise. Five years before, my husband, Joe, had stopped in Horta to get fuel and provisions when he crossed the Atlantic in our 42-foot Island Packet on his way to Southampton. I hadn’t been able to go with him, and he was eager for me to see Horta and help him find our boat’s name, Hope and Glory, which had been painted on the dock along with the names of the other sailboats crossing the Atlantic. While I was looking at the dessert menu, the ship shuddered to a halt. Everyone jumped up and headed for the deck outside the dining room. In the fading daylight, we could see the sailboat bobbing off our port side with sails flapping around its mast. At last, a crew member led a bedraggled man carrying a small duffle over his shoulder through the phalanx of cheering passengers. Passengers filled the deck and jostled for position to see what was happening. At the lifeboat station on the deck below, the lifeboat was carefully launched into the sea, now heaving in 16-foot swells. 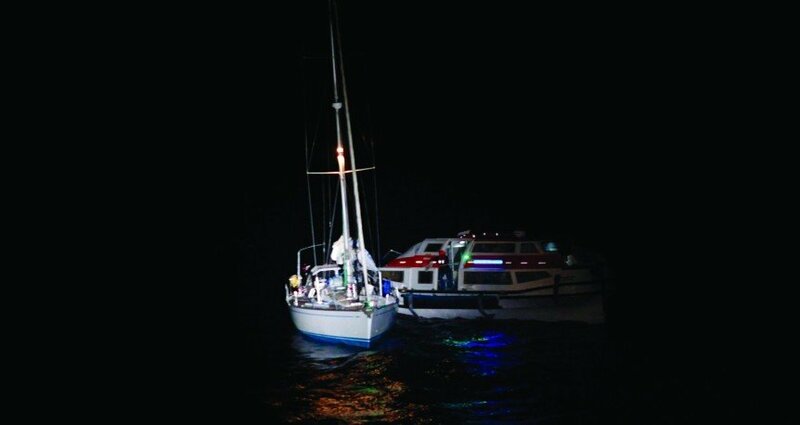 Daylight faded as the lifeboat started across the ocean; a spotlight illuminated the sailboat. It was pitch-dark by the time the lifeboat reached the sailboat. I stood on a deck chair to get a clear view. Flash after flash went off as passengers took pictures of the two boats. We held our breath as the lifeboat rocked back and forth. The crew brought the two rescued sailors safely back to the Nieuw Amsterdam and pulled the lifeboat back into the life station. Passengers crowded around while the crew called to keep a gangway open for the men to go inside. At last, a crew member led a bedraggled man carrying a small duffle over his shoulder through the phalanx of cheering passengers. He had a mop of long tangled hair, a burnt face and red-rimmed eyes. He was hunched over, probably trying to avoid our curious stares. Behind him came another man, older and heavier, who looked straight ahead as though the hundreds of passengers crowded around weren’t there. The sailors disappeared into the ship with several crew members behind them. We never saw them again. We dispersed to the cocktail lounge and discussed the evening’s events. Two days later, the captain held a meeting to review the rescue for interested passengers. I joined the crowd in the packed auditorium to hear the details. “You probably realized we changed course to rescue the stranded yacht when you were at dinner,” the captain said. “The Nieuw Amsterdam was the only ship in the area, so we were asked to turn around to offer help. “The yacht left St. Martin in the Caribbean for Horta on 23 April for Southampton. It is a 43-foot yacht named Embla. The captain and one crew were delivering it to Southampton for its owner. In the middle of the night, the rudder broke. They tried to repair it using the hatch door, but that broke loose, and they had been drifting ever since. They had food for one more week and a VHF radio. “The Embla alerted Norfolk via SAT phone, who in turn contacted the Nieuw Amsterdam,” he said. “They called the owner, and he agreed the yacht should be abandoned. “The ship changed its course to aid the yacht. I ordered the number 12 lifeboat on the portside to be readied. The first officer and the ship’s safety officer handled the rescue, aided by two other crew, one driving the lifeboat. “Did you consider not going to the rescue of the Embla?” a passenger asked. “What will happen to the yacht?” another passenger asked. “It will probably sink in the next storm,” the captain said. Patricia H-F Moore and her husband, P/Lt/C Joe Barnette, SN, are members of Sarasota Power Squadron/22. They have sailed for 30 years through the Great Lakes, Canada, the Caribbean, Bahamas, Central America and the Panama Canal. Patricia is the author of “Tomorrow is Another Day,” “Old Uffs’ Memoirs,” and many short stories.